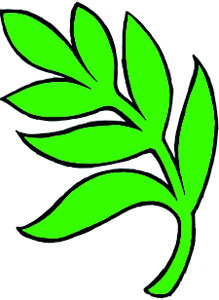 Children put palm branch stickers on a Palm Sunday Coloring Page. I make the stickers using Avery labels. You could also make a palm branch by gluing green fronds to a jumbo craft stick. The palm branch graphic is above. Children put dinner stickers on a Special Dinner. Again I use Avery to make the stickers of food. Children decorate an Easter Flag that is wrapped around a jumbo craft stick. Craft sticks are purchased from Discount School Supply. Add bright dot stickers or Easter stickers.